Lettuce is the common term for any plants of the genus Lactuca of the flowering plant family Asteraceae (or, alternatively, Compositae), and especially refers to plants of the commercially important species Lactuca sativa. The term lettuce also is used to refer to the edible, succulent leaves of L. sativa, which commonly are eaten raw in salads, but also may be eaten cooked. L. sativa is the most commonly used salad vegetable (Katz and Weaver 2003). Lettuce provides values for the ecosystem and for humans. Ecologically, the wild and cultivated forms of lettuce provide food for diverse animals, including insects (such as the larvae of some Lepidoptera), rabbits, and deer. Thus, the lettuce plants are foundational for food chains. In terms of humans, the cultivated lettuce plants are eaten, whether cold and raw as typical in some countries (in salads, hamburgers, etc.) or cooked as typical in countries such as China. Although generally considered a poor source of nutrients, lettuce does provide many of the same nutrients as other green vegetables, albeit mostly in smaller amounts (Katz and Weaver 2003). Its low calories make it a popular diet food. There also is some medicinal use attributed to lettuce, including ingredients considered useful as a sleep inducer and sedative. Both the English name and the Latin name of the genus are derived from lactis, the Latin word for "milk" or milk-forming, referring to the plants milky juice. The word sativa means "common" (Katz and Weaver 2003). Lettuce belongs to the Asteraceae (or Compositae) family, which is known as the aster, daisy, or sunflower family. It is a taxon of dicotyledonous flowering plants, including chicory, globe artichoke, sunflower, yacón, safflower, and Jerusalem artichoke. The Asteraceae is the second largest family in the Division Magnoliophyta, with some 1,100 genera and over 20,000 recognized species. Only the orchid family (Orchidaceae) is larger. Plants belonging to the Asteraceae share "all" the following characteristics (Judd et al., 1999). None of these traits, taken separately, can be considered synapomorphic. In the essential oils, sesquiterpenes are present, but iridoids are lacking. The most common characteristic of all these plants is an inflorescence or flower head; a densely packed cluster of many small, individual flowers, usually called florets (meaning "small flowers"). The composite nature of the inflorescences of these plants led early taxonomists to call this family the Compositae. Lettuce refers to those plants comprising the genus Lactuca. There are over 100 wild species of Lactuca, as well as the commercially grown Lactuca sativa. Lettuce (Lactuca sativa) is a temperate annual or biennial plant most often grown as a leaf vegetable. The lettuce plant has a short stem initially (a rosette growth habit), but when it blooms the stem lengthens and branches, and it produces many flower heads that look like those of dandelions, but smaller. This is called bolting. When grown to eat, lettuce is harvested before it bolts. Lettuce has been used for many centuries. The walls of ancient Egyptian tombs dating back to about 2500 B.C.E. have depictions of lettuce (Katz and Weaver 2003). The cultivated form of lettuce may have arisen from the oilseed lettuce (a thin stemmed, early bolting, wild plant with no head or rosette of leaves), via a process of selection for plants that bolted more slowly, with a thicker and shorter stem that was less bitter, and broader leaves (Katz and Weaver 2003). There are numerous mentions of lettuce in the literature, beginning with Herodotus in 550 B.C.E. (Katz and Weaver 2003). There are hundreds of varieties of lettuce (Lactuca sativa), and since they peak at different times of the year, production of lettuce for salads continues year round (Herbst 2001). There are generally four main groups of cultivars, based on head formation and leaf structure: head lettuce (L. sativa var. capitata), which can be divided further into butterhead and crisphead (iceberg); romaine or cos lettuce (L. sativa var. longifolia); stem or asparagus lettuce (L. sativa var. asparagina); and leaf lettuce (L. sativa var. crispa). Herbst (2001) recognizes as the four general lettuce classifications butterhead, crisphead,', leaf, and romaine, omitting the stem or asparagus lettuce. Butterhead, also called Boston or Bibb forms loose heads; it has a buttery texture. Butterhead cultivars are most popular in Europe. Crisphead, also called Iceberg, which form tight, dense heads that resemble cabbage. They are generally the mildest of the lettuces, valued more for their crunchy texture than for flavor. Cultivars of iceberg lettuce are very common in the USA. The name Iceberg comes from the way the lettuce was transported in the United States, starting in the 1920s on train-wagons covered in crushed ice, making them look like icebergs. Looseleaf, with tender, delicate, and mildly flavored leaves. This group comprises oak leaf and lollo rosso lettuces. Summer Crisp,, also called Batavian, which form moderately dense heads with a crunchy texture; this type is intermediate between iceberg and looseleaf types. 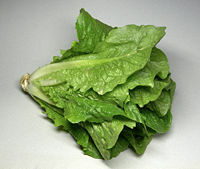 Romaine, also called Cos, is a head-forming type with elongated leaves. Chinese lettuce types generally have long, sword-shaped, non-head-forming leaves, with a bitter and robust flavor unlike Western types, appropriate for use in stir-fried dishes and stews. Chinese lettuce cultivars are divided into "stem-use" types (called celtuce in English), and "leaf-use" types such as youmaicai (Chinese: 油麦菜; pinyin: yóumàicài) or shengcai (生菜). 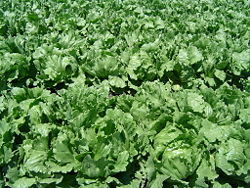 Some lettuces (especially iceberg) have been specifically bred to remove the bitterness from their leaves. These lettuces have a high water content with very little nutrient value. The more bitter lettuces and the ones with pigmented leaves contain antioxidants. The United States is the largest producer of lettuce in the world, with most production occurring in California and Arizona (Katz and Weaver 2005). Other areas with suitable climates include the Mediterranean Coast, the eastern portions of England, the Negev Desert in Israel, and parts of Australia. Major producers in terms of nations include Spain, Italy, France, Germany, and Greece. In some countries, lettuce is typically eaten cold and raw, in salads, hamburgers, tacos, and many other dishes. In some places, including China, lettuce is typically eaten cooked and use of the stem is as important as the use of the leaf. Lettuce is considered to be a poor source of nutrients (Bender and Bender 2005). While it is rich in calcium, iron, and somewhat vitamins A and C (Herbst 2001), and has many of the same nutrients as other green vegetables, it contains these mostly in smaller amounts (Katz and Weaver 2003). Lettuce is low calorie and is a moderate source of fiber, it has essentially no fat or protein, and is considered a relatively low to moderate source of vitamins and minerals (Katz and Weaver 2003). Darker green leaves contain the most nutrients (Herbst 2001). Lettuce is a source of antioxidants, which are considered to have anti-carcinogenic properties. Among the antioxidant compounds in lettuce are 0-beta-carotene (a precursor to vitamin A) and anthocyanin (which gives the red color in some varieties of lettuce)(Katz and Weaver 2003). The oil from large lettuce seeds are used for cooking. Some medicinal use is attributed to lettuce. The milky liquid in Lactuca sativa and its wild relatives, called latex, contains sesquiterpene lactones, which are the active ingredients in preparations used as a sleep inducer and sedative (Katz and Weaver 2003). Lettuce also is used in folk medicine to treat such ailments as coughs, nervousness, tension, and pain (Katz and Weaver 2003). Lettuce grown in low light, low temperature conditions in greenhouses in the winter may accumulate high levels of nitrate, which can attribute to blue baby syndrome in infants and may be carcinogenic (Katz and Weaver 2003). Judd, W. S., C.S. Campbell, E. A. Kellogg, and P. F. Stevens. 1999. Plant Systematics: A Phylogenetic Approach. Sunderland, MA: Sinauer Associates. ISBN 0878934049. This page was last modified on 2 April 2008, at 11:06.